Recently, I’ve been thinking a lot about the differences between establishing voice through the use of “you” or “we” or “I”. Which asks the reader to enter and enact the experience of the poem? Which implicates the reader and subverts possession? Which to use for poetry of witness, confession, commentary, embodiment? The choice seems inescapably political in the same way that bodies are made political and defined by spaces they inhabit. 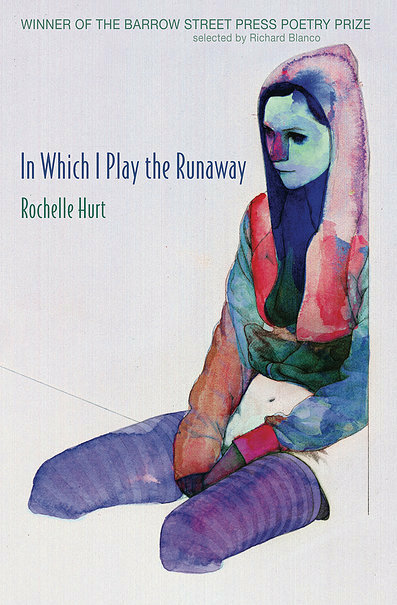 Many of the poems in Rochelle Hurt’s In Which I Play the Runaway are self-portraits set in the oddest named towns across the United States map. The names of these towns—such as Needmore, Indiana, Between, Georgia, or Nightmute, Alaska—draw attention to how a place or person takes shape under a name. Hurt’s speakers soak in the language of each town in order to locate the “I” at the point where name, body, and place intersect. I was born an apology. as slick as her knickers. of fathers leading out of our clapboard house. The anaphora built under the drum of “I was born” emphasizes not only the declaration of “I”, but that an origin “is expected to reduce body, deny agency, diminish presence”—to be born a woman is to be born an apology. Later, the line “You’ll never tell home from hurt, / my father said,” redefines this origin as a wound, suggesting that the selfhood of woman will often be indistinguishable from sources of pain. Yet the act of the utterance against a “trail of fathers” must be an act of resistance, and in this way “I” becomes one of the words hidden “like bullets under our tongues.” Every “I” on these pages blisters with unyielding and undeniable presence. These lines detail states of being in a kind of temporal hierarchy, and demonstrate how assertions of the self change according to time-dependent syntax. The benign past-tense assertion of self overtakes the present-tense assertion, and the present-tense assertion of self erases a system-threatening future in which women no longer only cry “I” in silence. In the last section of the collection, fittingly entitled “Honesty, Ohio,” a new voice splinters through Hurt’s persona driven language. This voice seems to be the poet confessing themselves as poet, one who wears masks of language in order to move the subject over the page. As one speaker claims, perhaps it is “[b]etter / if I am a metaphor, maybe,” in “Poem in Which I Play the Subject.” And this is a question because there are dangers to asserting the “I”— dangers that the devices of poetry perhaps allow one to step around. There are distancing layers—the Poet, the Persona—the husks, ways of talking to a subject without speaking as an “I.” Yet Hurt also presents the alternative, that putting on masks, or personas, performs one of many selves within the “I,” that the “I”, itself, arrives in splinters. The collection as a whole is a bite back against those who critique the confessional mode for embracing too much self, too much pain, too much of the category “woman.” Hurt’s “I” refuses to let her audience turn away—it insists on being. This multiplicity of selves echoes the women who refuse demands to cease existing. Likewise, the image of Dorothy skipping down the yellow brick road flanked by her male companions forms a strange reflection of an image found in “Self Portrait in Miracle, Kentucky,” where the speaker describes “girls who never stop descending / the stairs between two men, their back growing smaller / like balloons let drift above.” Both images critique this culture in which women are outlined, defined, by how they are able to serve the men at their sides. There is no seeing past this. Instead of conforming to a received form, and breaking from the expected to refresh, Hurt breaks into form, seamlessly stitching sound to meaning. Hurt doesn’t provide a final resolution—the insistence of the “I” must persist or it will soon be engulfed. Instead, this book houses a moment where the “I”s of women are able to rise out of a desert language and shake themselves loose of silencing sands. Madeleine Wattenberg studies poetry in the MFA program at George Mason University. She also holds an MA in English from the University of Cincinnati. Her work has recently appeared or is forthcoming in Mid-American Review, Muzzle Magazine, Whiskey Island, Minola Review, Devil’s Lake, Ninth Letter, and Guernica. She serves as assistant blog editor for So to Speak: a feminist journal of language and art.